Last week’s blizzard Jonas may have made a fun day for jumping in snow piles, but it put a total damper on a bevy of artists waiting to present themselves to the hungry art world. This week, make up for lost time at Last Rites’ rescheduled Allison Sommers opening or the most popular winter pool party at the Grace Hotel, hosted by artist Annika Connor. Two LA artists with opposing views come together at Joseph Gross Gallery, while Katya Grokhovsky invites visitors to put their hands all over her exhibition. Peter Caine brings a pooping robotic Ronald Reagan to a gallery on the Lower East Side (enough said). 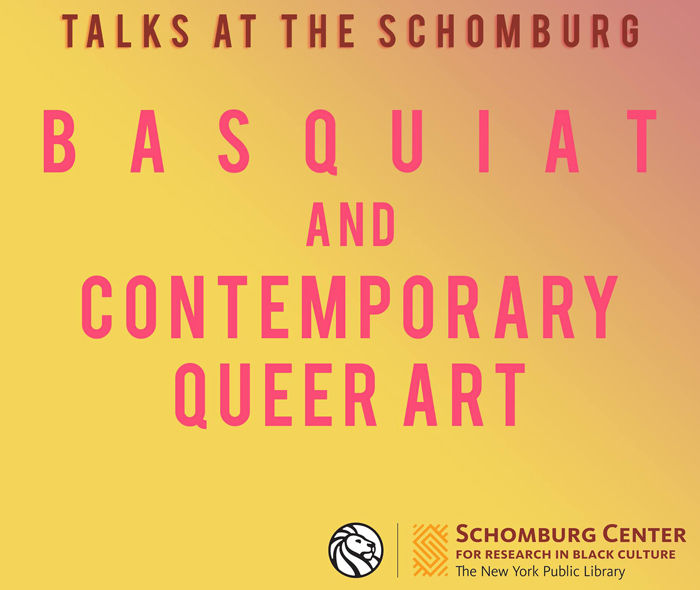 Times Square Arts invites guests to meet their first artists in residence, and the Schomberg Center invites Basquiat fans to a talk relating his work to its effects on African Diasporic communities. Peter Caine’s animatronic robotic sculptures wowed at PS1 a few years ago. 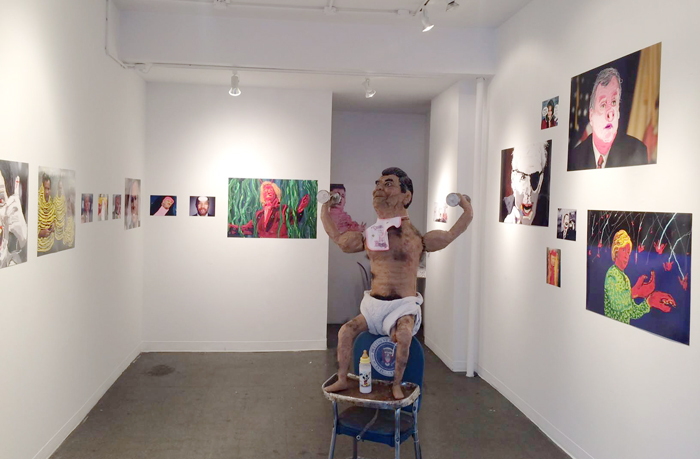 Now, Caine puts his grotesque spin on the 2016 primaries, with surreal portraits of our favorite candidates…and a robotic sculpture of a shitting Ronald Reagan to boot. Tonight’s show features two self-taught artists who are based in Los Angeles…but their similarities end there. Mr. Herget’s work is painterly impasto with a tactile aesthetic, while Knowledge Bennett is straight up pop art–and features a lot of groin grabbing. Tonight, Katya Grokhovsky’s evolving exhibition comes to a head when visitors are invited to not only see the art, but also to touch it! 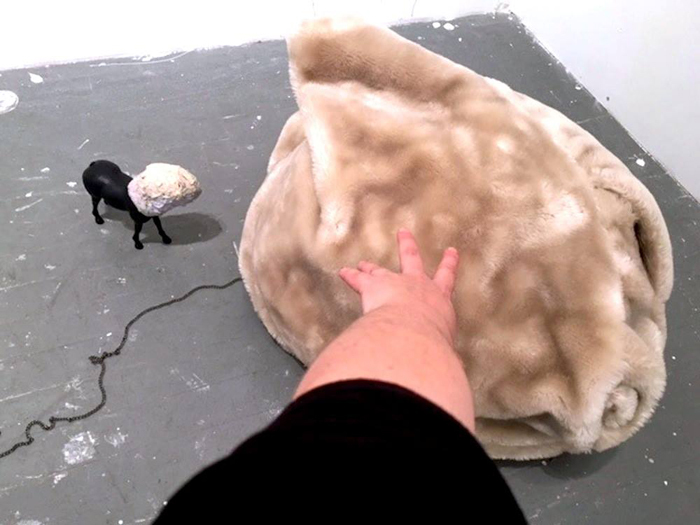 Touch all the art you want, then stay for a performance by Christen Clifford. 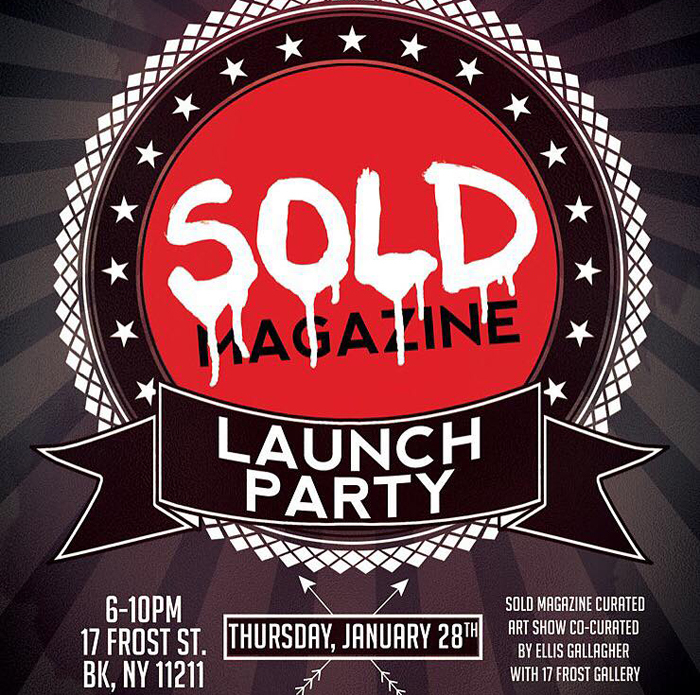 For their first “artists by artists” magazine, SOLD is throwing a bash that includes an exhibition curated by Ellis Gallagher, along with a boozy party. 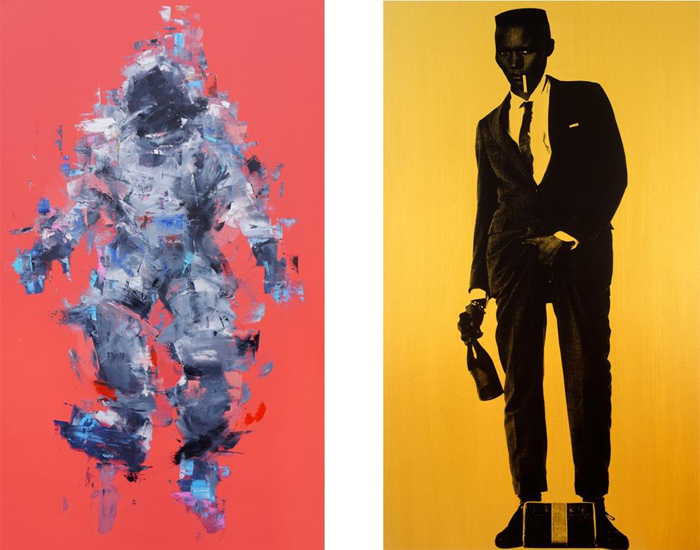 Check out works by Crash One, Dain, Chris RWK and more. 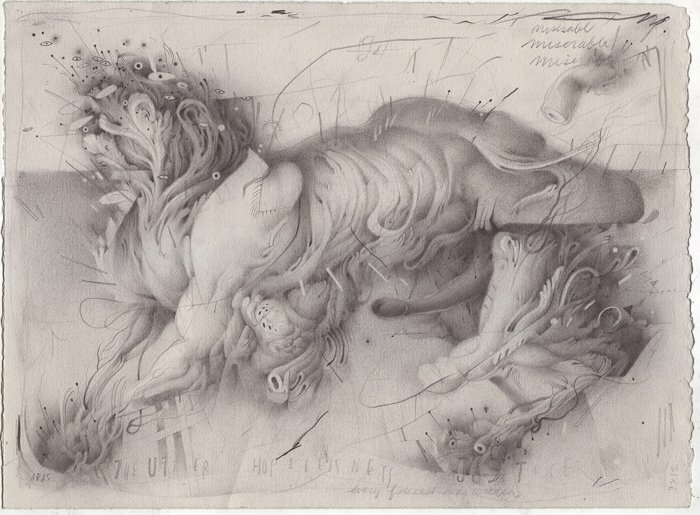 Postponed by Jonas, tonight you can finally check out the beautiful miniature drawings and watercolors of Allison Sommer. Her ability to render the morbid and grotesque with a gauzy haze of delicacy makes the subject almost glamorous (the Victorians would have approved). Friday’s show is a slight departure from her previous work, inspired by a poem by Wilfred Owen whose text is incorporated into Britten’s “War Requiem,” and incorporating collage into her multi-layered drawings and paintings. January 30, 8:00 p.m.-2:00 a.m. Romantic painter Annika Connor’s yearly January pool party soiree got blizzarded out last weekend, but never fear, swimsuits can be worn this weekend. If you happen to be beach ready in January, enjoy a winter swim alongside the artist and her friends, as well as music by Ian Mellencamp, saunas, dancing and a complimentary vodka gimlet. Times Square Arts launched its first artist residency program last fall, an interesting program that uses the heavy traffic of Times Square to engage artists with the public. Tonight, hear the fruits of their labor, so to speak, and meet the pioneer artists. In conjunction with the exhibition “Basquiat: Still Fly at 55,” tonight’s talk explores and historicizes the cultural phenomena and life events that laid the foundation for Basquiat’s creative genius and his undeniable impact on African Diasporic communities across the globe. If you can’t get up there, you can watch it in your jammies on livestream!